We’ve seen telemedicine transform medical practices in many ways. The option of video visits improves work/life balance for providers by allowing them to do some visits from home or other locations outside of the office. It makes patients very happy by eliminating the need to travel to the office or take time off from work. It improves patient outcomes by making follow-up compliance more manageable, and telemedicine reduces some of the burden on administrative staff. These are awesome benefits that most practices expect, but what comes as a pleasant surprise to many is the positive impact on the bottom line. This post covers some of the ways that practices see financial benefits from video visits. When implemented effectively, the cost of telemedicine technology can be recovered in as little as 30 days. After that, it’s all upside. Here’s how telehealth boosts profitability. In addition to seeing more patients on the days you are already open, telemedicine gives practices the option of expanding hours into the evening or conducting some visits on the weekends without any increased office expense. This provides increased flexibility for both providers and patients and increases earning potential even more. The most valuable asset in any medical practice is the providers time. When people don’t show up or cancel at the last minute that perishable asset is wasted, and the lost revenue can’t be recovered unless a strict no-show policy is in place and enforced. Video visits help keep no-shows and late cancelations to a minimum by making it more convenient for patients to keep their appointments. They don’t need to worry about travel, missed time from work, lost PTO, or child care issues, all frequent causes of missed appointments. What’s more, if someone calls to cancel an in-person appointment, it may be possible to simply change it to a video visit instead. That’s a win for everyone. When people know they won’t have to go into the office for every visit, they can consider providers at a greater distance. Reducing the importance of location can help increase the number of patients that might be attracted to your practice and help you retain patients when they move. Another way to expand market size is to offer additional services. Weight loss coaching, smoking cessation, and other lifestyle-related services make a great addition to a practice when they can be done without impact to more traditional services. Some practices even partner with schools to provide screening and other care for students. Video visits usually result in fewer people in the office making flow easier for patients who do come in and reducing some of the pressure on your office staff. This results in higher customer satisfaction for patients both online and off and frees your team up to do other work or to focus on finding opportunities for improvement within the office. Most insurers do not reimburse providers telephone only follow-up time. Things like reviewing test results and medication checks typically go unpaid if they are done over the phone. We’ve got good news! By adding a video component, many of these encounters become reimbursable. Using video also makes these conversations more likely to be understood by the patient. You can take getting paid for follow-up calls to the next level by participating in the Medicare Chronic Care Management (CCM) Program. Medicare typically does not yet reimburse for video visits that originate from the from the patient’s home, but there is an exception. The Chronic Care Management program offers a monthly fee per patient for providers who care for people with two or more chronic conditions. The program requires 20 minutes per month of documented clinical care, for which a video visit qualifies. The CCM program is a simple way to increase practice revenue and provide a valuable service to the patients who need it most. Improving the profitability of your practice is good for you, it’s good for your staff, and it’s good for patients. Profitable practices are healthy practices that are able to keep up with financial demands and invest in new ways to deliver the best possible experience for patients. 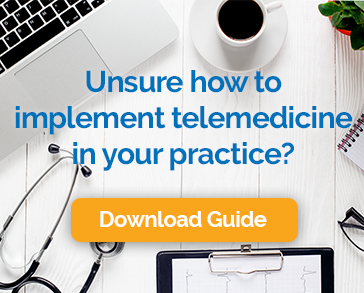 Implementing a telemedicine program is a low-risk, high-reward way to get there.